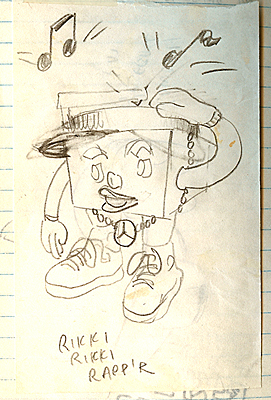 Found in the moldy old noteboks from the 80′s. Here’s a sketch I did one day for a kid’s toy concept. Rikki Rikki Rapp’r. Idea was to have a physical scratching device inside a bright colored plastic housing – kid safe 2 years old and up. Sort of like the way we used to put baseball cards on our bike wheels to make a clicking sound. There’s a dirth of “hip hop” toys out there now, but this seemed pretty silly back in 1988. Now it’s mainstream.